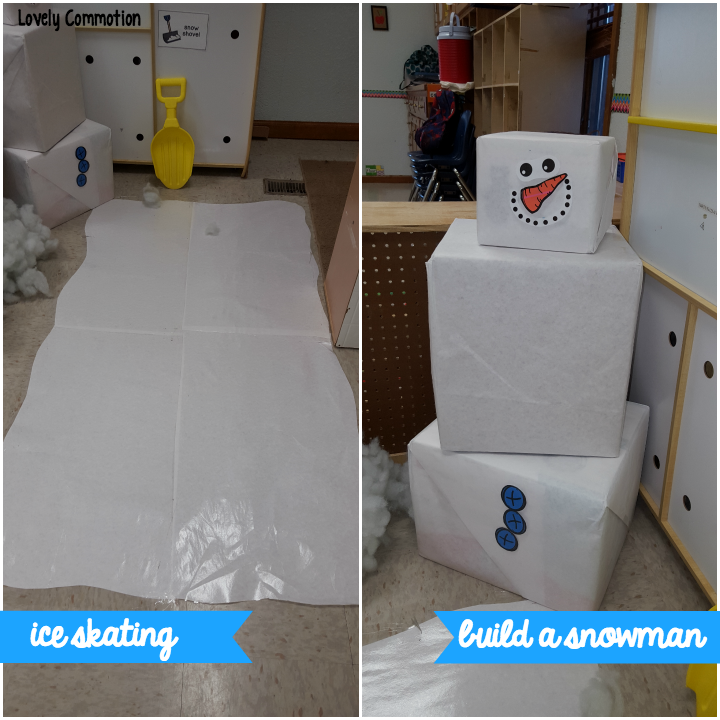 Create a winter wonderland in the dramatic play center for your preschool children! It may be winter outside, but we are bringing the cold inside this week too! 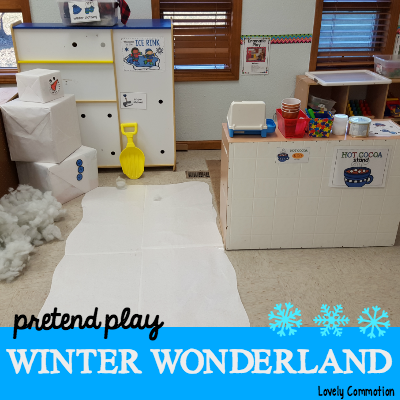 Check out our Pretend Play Winter Wonderland! Students can ice skate in socks on this homemade 'ice rink'. 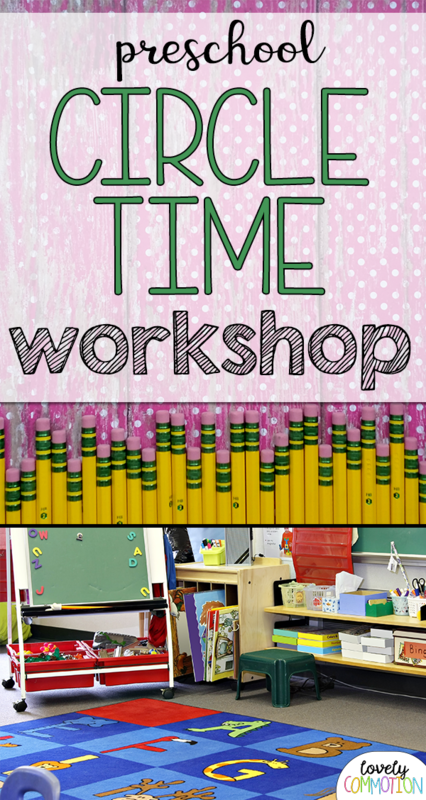 By taking white bulletin board paper, laminating it and taping it to the floor, students can now move those gross motor muscles, all while having fun! Enchance your winter pretend play center by adding a hot cocoa stand! We also have a square snowman in our Winter Wonderland. The three boxes stack and also nest for size comparisons. The snowman pieces are put on with sticky tac and can be moved around to create a silly snowman! A winter wonderland is not complete without some hot cocoa! So, I added a hot cocoa stand to our area as well. With a cash register, empty coffee cups with lids, spoons and pretend cocoa mix, the kids were ready for business! Want to get all the printables you see in this Pretend Play Winter Wonderland? The Pretend Play Props: Winter Wonderland is available now! The grass is greener, the flowers are beginning to bloom and kids can be heard playing outside. It's spring and with spring comes wind. So, instead of wishing the wind away, we made lunch sack kites to fly in the wind! These kites were perfect for my 2 and 3 year olds. Plus I had all the materials on hand! To create your paper bag kite, just follow these easy steps! 1. Decorate both sides of the brown paper sack. My kiddos used markers and stickers. If you have enough drying time, I think glitter glue would look cool in the sunlight! Add streamers with tape to the opening of the bag (optional, but fun!). 2. Cut a small hole in the middle of the bottom of the bag. 3. Tie the string or yarn to a craft stick. Put the string through the hole in the bottom of the bag, from the inside. The craft stick should be inside the bag, stabalizing the string. 4. Let it fly! Hold onto the string and run! We even tied our onto the swingset to watch them fly. Have you ever made a kite with your kids? How did it turn out? Ribbit! We had a frog filled day today as we focused on the color green! We did lots of frog preschool activities, along with a frog craft. Check out the froggy fun below! This is a fun game I made a while back. It's Frog Bowling! To make this game, I collected Gerber's Puff containers and taped on frogs I had printed out. I also put number stickers on each 'bowling pin'. To make the base of the game, I used a file folder game and traced around the bottom of the Puff's container. Then, I added number stickers to each circle. I used 6 'bowling pins' for this game. Frog Bowling Skills: Gross Motor (rolling the ball towards a target), Number Recognition (matching the numbered pins to the numbered circles), Counting (the number of pins knocked down) and taking turns (if playing with multiple children). We got our hop on as we jumped from lily pad to lily pad. We also used stuffed frogs to practice tossing. We tried to get the frog to land on the lilypad. To make this game, I used non-skid shelf paper in the color green. I just used scissors to cut different lilypad shapes. Lilypad Gross Motor Skills: Gross Motor (hopping and throwing) and Learning about force (how much force was needed to throw the frog and get it to land on the lilypad). During circle time, I brought out our frog puppet (sorry no photo). Of course the kiddos loved the puppet, but that little frog had some learning fun up his sleeve! Our particular frog puppet only liked green things. When he was given something green he would kiss it! When he iven something that wasn't green, he'd throw it! Crazy little frog! Boy, did this cause some explosive laughter from the little ones! Plus, it helped them focus on objects that were green and objects that were not. Materials needed: Paper plate, green paper (cut into frog legs), green paint, bubble wrap and paper eyes. To prep this craft, take a piece of bubble wrap and fold it in half (bubble side out). Staple it shut on the sides and top. This makes a bubble wrap mitten for the kids to paint with! Show your children how to dip the bubble wrap mitten in the green paint and stamp onto the paper plate. Once dry, add the green legs, eyes and draw on a mouth. Now isn't he just cute?! Do you have any favorite Frog Activities? Recently, we went to a hockey game and my little man was all about it. So, I got him some little kid hockey sticks and a puck for his upcoming birthday. But, in the meantime an idea popped into my head! Apparently it was a good idea, because my little guy has not stopped playing it since creation. What is this game you ask? MARSHMALLOW HOCKEY! First, start by taping a square in the middle of the floor (I used washi tape). Now, all you have to add is some mini marshmallows and brooms (or Swiffers)! We happened to have a child sized broom, it worked great. But, my little guy prefers the Swiffer. I took a section out of the Swiffer's handle (the sections of the stick just screw together), this way I could make it shorter for my little guy. The goal of the game is to get as many marshmallows into the square using the brooms. *Gross Motor- Manipulating the broom. *Concept of Force- When he sweeps the marshmallow toward the goal, he is learning about how much force it takes to get to the marshmallow to the goal. *Counting- When most of the marshmallows are in the goal, I ask him how many him has left to get in and we count together. *Concept of 'in' and 'out'. This game is super easy and according to my little guy, super fun! A word to the wise, put a rolled up rug in front of the stove so marshmallows don't roll under there- yes, I know from experience. 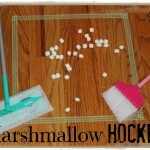 I hope you give Marshmallow Hockey a try- come back and tell me about it! Can you tell we have been enjoying some time on the driveway lately!?! After painting the driveway, I decided to make a mini town and roads to drive on for my outdoor loving kiddos. Our tiny town has curvy roads, a stop sign, stores and a favorite restaurant. I loved watching the kids pretend to give their cars a bubble bath at the car wash and fix their bike at the fix it shop with our play tools. Their favorite place in our town to visit was the golden arches (of course). I took their order as they drove through the ‘drive-thru’ on their bikes. Oh the fun of it all!